These whole wheat pumpkin muffins are filled with a sweetened cream cheese filling in the center. 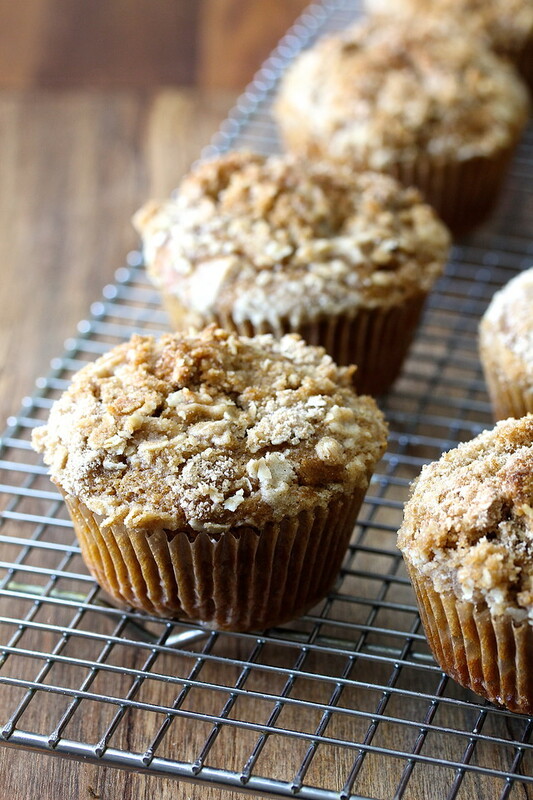 They are also topped with an amazing streusel topping. While pumpkin is pretty much a cliche this time of year, these muffins are so worth it. I used 1/2 of a can of pumpkin puree, and saved the rest for pumpkin martinis, these pumpkin chocolate chip cookies, cranberry pumpkin rolls, these pumpkin dinner rolls, and these cinnamon swirl pumpkin rolls later. As you can see, I've done a pretty bad job resisting the pumpkin trend. Does anyone remember the pumpkin puree shortage of 2015? Yes, I fell for it. I pretty much hoarded cans of pumpkin puree. Thank goodness I did, because I got to make these amazing muffins with some of the pumpkin I had on hand. These muffins are made with white whole wheat flour, which means they are filled with whole wheat goodness, a great way to justify having more than one. White whole wheat flour contains all of the goodness of whole wheat flour, but with a milder flavor. You could also use regular whole wheat flour, but the cool part about white whole wheat flour is that you can fool the kids (or anyone else who is anti-whole wheat). All purpose flour also works with these muffins. Either way, these are the perfect breakfast muffin. Plus, they are filled with this amazing sweetened cream cheese filling. Protein, right? This is why I justify having them for breakfast. The recipe calls for boiled apple cider, which I purchased from King Arthur Flour. You can also use dark corn syrup, maple syrup, or honey. 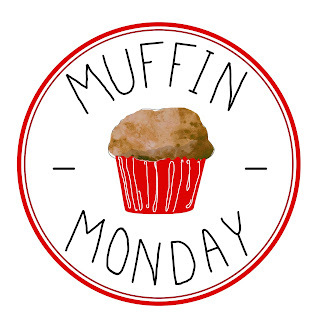 It's Muffin Monday time. After the recipe, check out the rest of the muffin recipes from the Muffin Monday bakers. 227 grams (1 8 ounce package) cream cheese, at room temperature. Preheat the oven to 400 degrees F. Line a 12 cup muffin tin with muffin papers and spray them with spray oil. To make the streusel, add the flour, sugar, and salt to the bowl of a mini food processor and process. Add the rolled oats and butter, and pulse until you have coarse crumbs. Set aside. To make the cream cheese filling, whisk together the cream cheese, sugar, and vanilla. Set aside. To make the final dough, whisk together the pumpkin, eggs, brown sugar, oil, cider, and milk in a large bowl. In a medium bowl, whisk together the salt, spices, baking powder, baking soda, and flour. Drop a heaping tablespoon cookie scoop of batter into each muffin cup. Drop a scan tablespoon cookie scoop of cream cheese mixture into each muffin cup. Drop a heaping tablespoon cookie scoop of batter into each muffin cup, on top of the cream cheese mixture. Divide the streusel mixture among the 12 muffins. Bake the muffins for 18 to 20 minutes. Cool the muffins for about 5 minutes in the pan. These muffins are best served fresh within 2 to 3 hours. Leftovers can be kept in the refrigerator for up to 3 days. To freeze, individually wrap each muffin and freeze up to 30 days. Reheat in the microwave for about 30 seconds. Ha! I remember the shortage. Fortunately I'm a hoarder from way back so I already had some in the cupboard while everyone else was scrambling. Things like canned pumpkin and cranberries are very seasonal here with stores only bringing in what they think they can sell for Christmas, which leaves us completely out of luck at Thanksgiving time if shipments arrive later. Pumpkin and sweetened cream cheese is a gorgeous combination, Karen! These would be perfect for breakfast on Thanksgiving or Christmas Day. Thanks so much Stacy, and thanks for hosting every month. I tend to hoard the cranberries myself whenever I see them around Thanksgiving. I remember shortages of pumpkin everywhere but my back yard and basement Strategic Winter Squash Reserve! I had pumpkin vines volunteering all over the place. Not this year, surprisingly. The only volunteers have appeared in the middle of the lawn, and my son mows over them every weekend so they haven't gotten far. They're still pluckily chugging along though. I think I cannot wait to bite into the sweet cream cheese filling--that looks delicious! I picked up some new-to-me small cookie scoops at a recent tag sale and have quite the assortment of sizes now. These muffins sound like an excellent reason to play with my new toys! Middle of the lawn, lol!! I have quite a collection too. I cannot resist those cookie scoops, or any baking equipment for that matter! 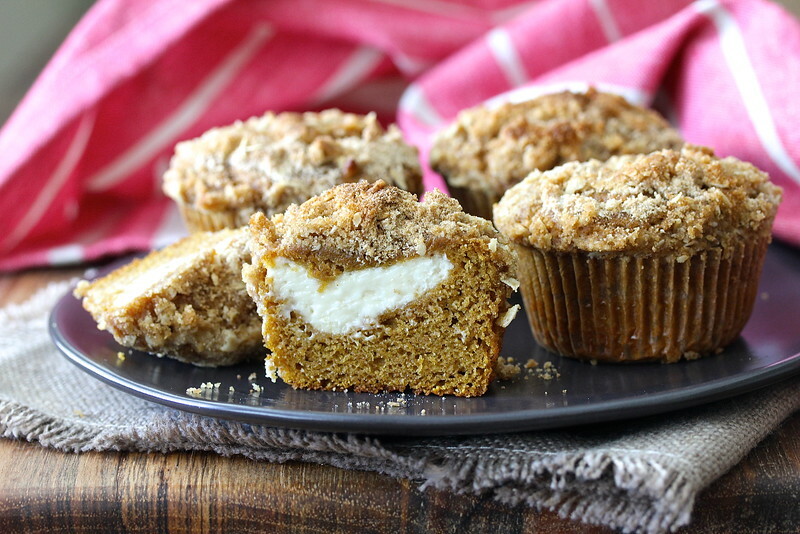 YUM, like a pumpkin roll but in muffin format. Perfect. You're right! Never thought of that! Much more portable, right? That boiled cider is my *secret* (not so secret) ingredient for all good things in the fall! Love that stuff. I've even used it in cocktails. You could probably boil it down yourself, although I think buying this product is way easier! It's pretty amazing. P.S. Sally, I checked the ingredient list, and it is just apple cider, no sugar added. It's very dark, and has the consistency of maple syrup. It's all for goodness and joy! Those muffins are fall. They are gorgeous!! Thanks Rebekah! It's 102 degrees here today, but at least I have these muffins!